There are three smartphones that can be said to be aimed directly at photographers looking to do some serious work with a camera phone. 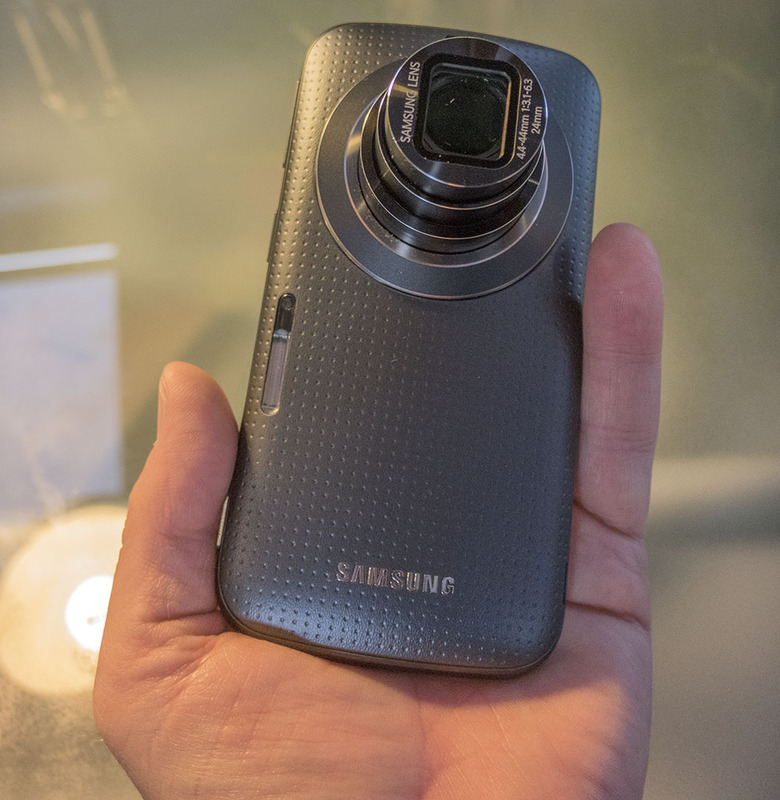 The Nokia Lumia 1020 with it's 41MP sensor, the Panasonic CM1 with a 20MP - 1" sensor and this, the Samsung K zoom with a 10x zoom. (Approximates to 24-240mm in 35mm terms) So a smartphone with a small, but serious zoom covering a wide range of focal lengths. Is it any good? Nice clear bright screen. Not as good as the Nokia, but certainly better than the CM1. Nice range of controls. Lot's of scene settings etc. But also useful modes like Macro. Image quality overall below the standards of the Nokia and Panasonic. Fiddly to operate. I have great difficulty in operating it without pressing a switch or triggering something on the screen. Ergonomically not great for photographers. There are a couple of things from the above list that I would wish to deal with straight off. Firstly the zoom is too big, because the quality at the long end just doesn't match the results at the wide-angle end, which are actually very impressive. As you can see from the three shots above, the camera is capable (via Photoshop) of producing lovely rich colours and nice sharp images. However at the telephoto end, much of the detail is lost and that's not just the result of atmospheric conditions. The images in the main gallery will look fine for web reproduction, but viewed at 100% they are not great. As you can see, the detail in the field of buttercups is 'smeared' and indistinct. This is a shame because it's the telephoto end that gives the camera it's appeal. 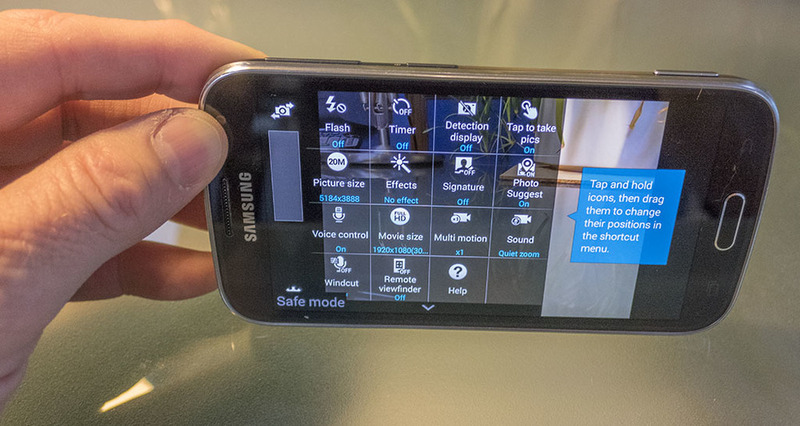 The second problem is that the layout of the phone is far from optimised for photographers. The interface is very 'busy' and the controls on the camera get in the way when I'm holding the camera. I take a lot of pictures by accident and all sorts of things keep popping up on the screen because I'm accidentally touching buttons. This is not to say that this isn't a useful photographic tool for me, it is. It has all the smartphone advantages for what I use these cameras for. Small, light, easy to carry. Inconspicuous and lets me blend into the background. Plus there is this look that I can get. I've often written about the fact that I sell a lot of film scans and I'm also still selling a lot of images I shot on my early 4, 5 and 6MP digital cameras. And these images do have a different look to much of the output from technically superior recent digital cameras. And yes (yawn!) it's that film look. It's no accident that smartphones and the editing programmes designed for them offer a lot of 'film simulations.' And those simulations are often not to the benefit of the image quality. Certainly my film scans (particularly the 35mm ones) are far from the same quality as those from my better digital gear. But as you will have noticed, I process most of my library images to fit this style. High Saturation, contrast pushed to the limit and not really bothering about the luminance noise / digital 'grain' that might be created. And this is a formula that has proved very successful for me. In fact I've just had a recent sale of an image used for advertising that was shot years ago on a 5MP Minolta 7i & given a very 'punchy' 'colour pop' look. So what I do with most of my smartphone pictures (the same as my other images but even more so) is push them as far as I can in terms of colour and contrast and even add some digital noise to simulate film grain, which has the benefit of appearing to add some detail where the original has had it smeared away with noise reduction. And it seems to work. These images are also being sold a print reproduction sizes as well as being used for websites only. This is all possible because of the way images print in terms of magazine and book reproduction. I've always been surprised by how much better images look printed than on a computer monitor and the nature of that print process does seem to eliminate a lot of the noise and other degrading effects that we see only too clearly on our monitors. So basically what I'm saying is my phone pictures will reproduce much better than they look on my screen. And the K zoom images I'm creating will certainly cover A4 with no problem and should even handle A3 pretty successfully. When I factor in the size the overwhelming majority of my images are reproduced at, i.e. less than A4, there isn't really any issue about me shooting images on phones. I've also never quite understood the 'every blade of grass is sharp' attitude. Why on earth is it important that every blade of grass is shrarp? 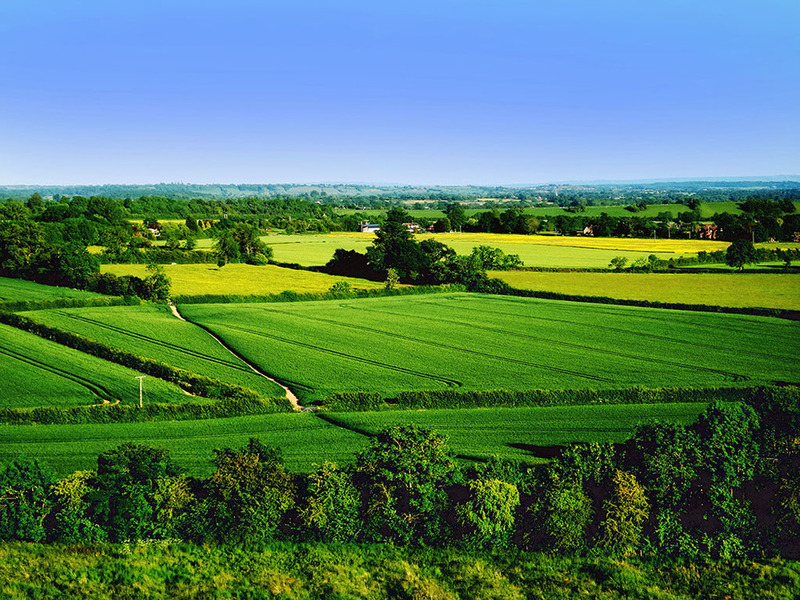 Landscape / Travel / Location photography is mostly used to 'sell' a place to a potential audience. It's not scientific, medical or forensic photography, so while high resolution and detail is nice to have, it's far from essential. In fact colour, contrast and getting the levels right is a far more important consideration in terms of an images commercial potential. I have to confess that this did concern me when I started taking smartphone pictures, but subsequent sales have proved my worries to be unfounded. So despite the K zoom not having the best smartphone quality I've seen, it's still a very useful camera for me and I've been using it a lot since I bought it, usually in conjunction with another camera. Would I recommend it? Well yes with reservations. 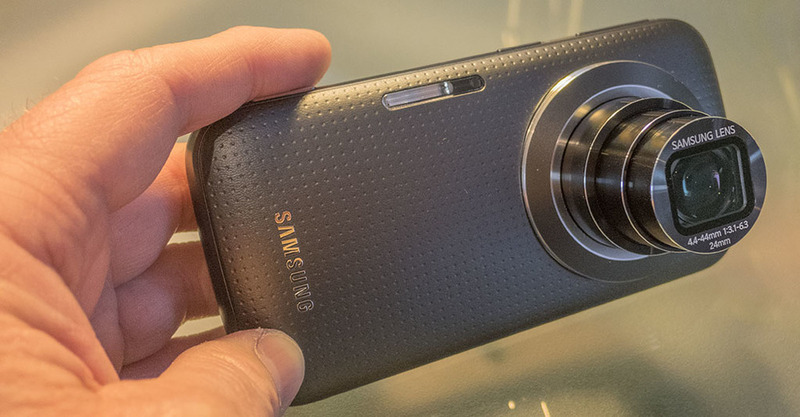 If you like the idea of a smartphone with a zoom then there isn't a lot of choice. There are those bolt on Sony things, but having it all 'in house' is a much better idea as far as I'm concerned. Plus I am shooting images intended for commercial use on it, so I obviously think that the files are capable of being reproduced to the appropriate standard. However, if you have one of the better Nokias, the CM1 or an iPhone / iPad then the image quality may not be quite what you are used to, But then none of those has a zoom function which means you miss out on a lot of picture possibilities. I like it and with it's reduced price I like it even more. It's also easy to find a place for it when I'm out shooting, so I will use it a lot. Every time I go out I have at least two smartphones with me, so I'm never short of a camera. And that is actually a lot of the point of camera phones. Always accessible, small footprint, versatile picture creating devices that raise no alarms and create no anti-photographer ill will. What's not to like? N.B. I'll check out the video at a later date.